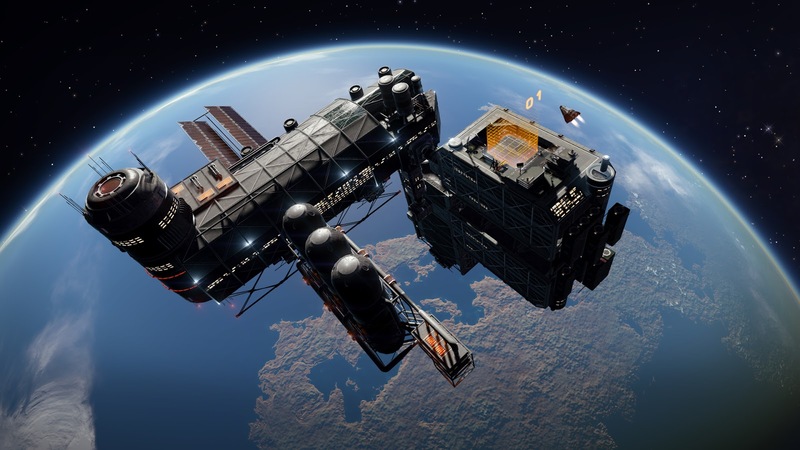 Elite Dangerous is a massively rich, complex, and evolving space simulator. With stunning graphics, liquid-smooth 60 FPS action, and a range of missions to satisfy every style of gameplay, Elite: Dangerous on the Xbox One proves that even the most sophisticated simulators have a place on the home console. Suit up fellow space junkies, Elite: Dangerous is here to stay in a powerful way. 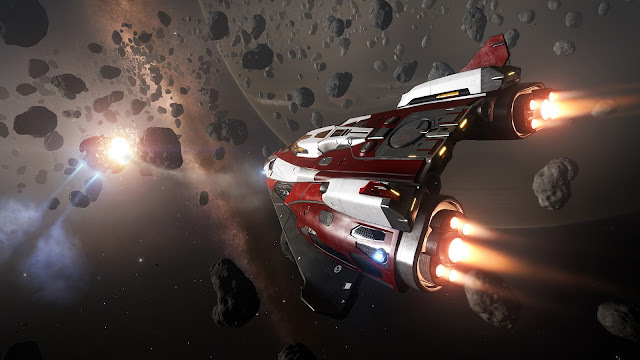 When I previewed Elite: Dangerous in 2014 I was stunned; I even claim that it was dangerously close to being "perfect." That sentiment still stands today, well after the PC release and now residing on the Xbox One, Elite: Dangerous is simply wonderful. One of the biggest concerns that I had was my own ability to adapt to using a controller rather than my HOTAS system for the PC. At first I was utterly useless; on the PC I had 70+ buttons on my flight stick that I meticulously bound to the many actions that one can make in the game. On top of that I used the utterly fantastic Voice Attack application to "speak" to my ship (essentially a voice-activated macro tool) so menial tasks like deploying/retracting hardpoints, cargo bays, or landing gears as well as jumping to hyperdrive or scanning bounties/cargo ships. The simple task of stating "Jump to hyperspace" rather than rolling through a few menus simplified the process significantly and I was unsure how I would get along with the Xbox One and it's lack of voice communication. Surprisingly the button bindings for the Xbox One fulfill all necessary functions quickly and efficiently (once you get used to them that is). The biggest struggle I had was with the x, y, and z axis for movement; with a HOTAS it is as simple as rotating or tilting the flight stick, with a controller it is a matter of manipulating the bumpers and both sticks. In truth I would give my left foot for an Elite: Dangerous-branded, Xbox One-compatible HOTAS system as it would simplify movement significantly. 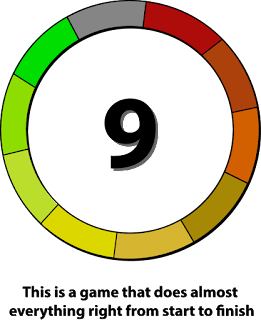 In time, maybe, but as of right now you will need to make-do with the controller (though it is not inherently bad). Comparing the Xbox One version to the PC version is a bit unfair given the power of a PC can scale dramatically whereas the Xbox One while powerful, may be limited a bit in what it can do graphically. In the case of Elite: Dangerous the Xbox One version looks *stunning. * The lighting is stunning and the models and textures look crisp, clean and detailed. The real treat though is when you are in combat, circling your foe in attempt to dispatch them; watching autocannon rounds shred into hulls, pulse lasers burning through shields or torpedoes slamming into frigates is an absolute joy (one that more often than once I just sat and watched, almost to my detriment). Stations are gloriously detailed and provide a lived-in atmosphere to the massively open expanse of space. This is a perfect segue into what one could consider either the best or the worst feature of Elite: Dangerous. The universe is infinitely huge in real life and Frontier Developments has done wonders in replicating the vastness of space. I have never been so impressed with a gaming environment as I have been with Elite: Dangerous which is saying something since space is empty. Very empty. Yet Frontier Development has managed to make it feel populated while not making it feel small. The downside to the size is that when you are 30,000 light years from your chosen home system it can take a significant amount of time to get back. I personally do not mind, but others might. A benefit to that size is that there are dozens of missions available in most systems. From smuggling runs to bounties to trade runs, there is a massive selection for gamers to choose from. There really is something for everyone as not all players are like me and will want to get into the smuggling aspects, but instead rather go for the action-y style of a bounty hunter. As you complete missions you will raise your faction reputation which then opens up new missions and new ships. Admittedly faction rewards are slim right now, but with the planned updates there will be plenty new in the future. 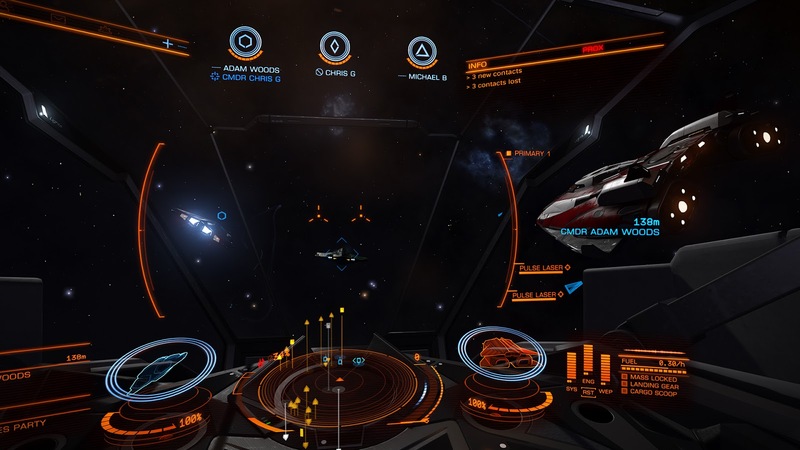 Some of the missions can be brutally hard, especially the bounty ones; if you see a bounty listed for 100,000 or more credits you may want to stay away unless you have a full wing of buddies with you because those marks are incredibly hard. To combat the difficulty you will want to have the appropriate ship and armaments otherwise you will find yourself outgunned, out tech'ed, or simply out-flown. 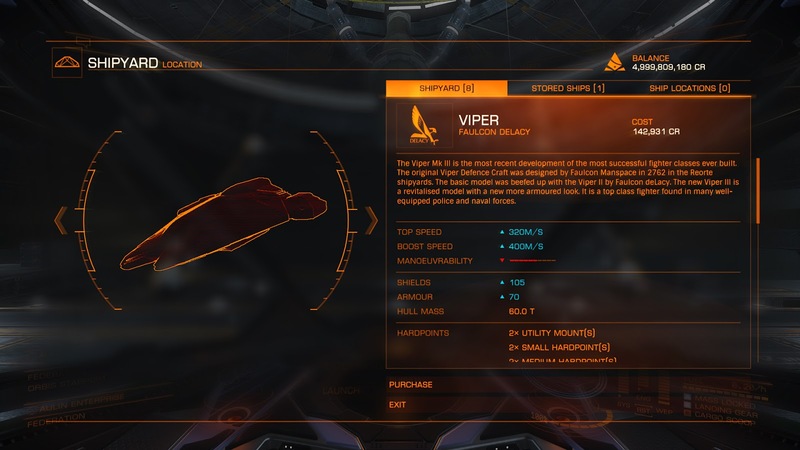 One of the more popular ships, the Viper, is a solid performer that has decent armor, a lot of hardpoints, average cargo space and a whole bunch of speed. While it is an excellent all-around performer, gamers who are more into the exploration aspects of Elite: Dangerous may want to look into ships like the Asp, or if you are a fan of taxiing people to and from various systems you may want to look into the Imperial Clipper. I personally use an upgraded Eagle (one of the starting ships) as it is fast. Extremely fast. My personal style of combat is a bit different than the atypical Elite: Dangerous style of "fly in circles." Instead I make a bee-line straight at my target with my engines and shields maxed out, unleash my various weapon groups, then streak right past the combatant. From there I boost away and rinse/repeat (similar to cavalry charges of old). This method allows me to go through and easily track the target and evade their oncoming attacks, which is a necessity as the Eagle is notoriously armor-free; it is the equivalent of a space-capable box of tissues. But I love it. With the scope of missions, stunning graphics, amazing sound, and sheer number of ways you can customize your ships to your play style(s), Elite: Dangerous is one of the few titles that will forever stay installed on my Xbox One. Though it may be weak right now in story, it more than makes up for that in pure character. There is a little bit of everything in this space simulator for any style of gamer.